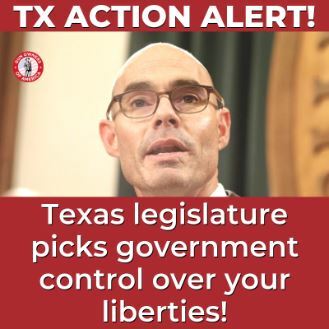 Take Action: Use the contact form below to urge Speaker Bonnen to bring up Constitutional Carry legislation for a vote. And you can email your own Representative using the contact information at the very bottom of this alert. 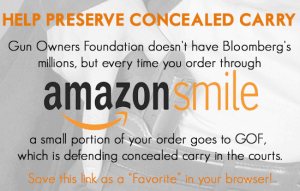 As you may have heard, a lot has happened with Constitutional Carry this past week. Last Thursday, Speaker Bonnen made it clear in a media statement that he opposes Constitutional Carry. Then again on Saturday, he issued a blatantly false statement, alleging that constitutional carry advocates are fringe activists who want criminals to carry, and pledging to uphold “a license and proper training” for handgun carry. We are outraged at these untruths from the Speaker and appalled at how out of touch this statement is from his own party. He is claiming the actions of one lone advocate as the reason for his dismissal of the policy, but it’s clear that he simply wanted someone else to blame in order to take the heat off himself. As I have already said, due to the ridiculous delays on scheduling a hearing for HB 357, the only path to passage was for leadership to prioritize the issue. With these blunt statements of opposition from Speaker Bonnen, we have his answer: he refuses to prioritize Constitutional Carry and he has closed the door to passage of HB 357. Representative Stickland, the author of HB 357, announced on Friday that he has withdrawn his request for a hearing because at this point in session, holding a hearing for HB 357 would be pointless political theater and it would be a waste of your time to make the sacrifice to travel to Austin and testify for Constitutional Carry. We certainly don’t want to ask you to make a needless sacrifice. At this time, we do not anticipate a public hearing for constitutional carry at which you could express your opinion to the legislature on public record. We are by no means backing down from the fight for upholding your liberties, which includes repealing the handgun ban and getting rid of the license requirement for carrying your defensive tool. Your right to keep and bear arms is currently being infringed by Texas law. That is unacceptable and we will never compromise in the fight for liberty. Please be sure to contact Speaker Bonnen (ABOVE) and your own state representative (BELOW) and express your displeasure. Keep in mind that the failure of Constitutional Carry is by no means the work of one person. Although the Speaker could have prioritized the issue (but didn’t), every single one of the Representatives should have signed on to the bill to show their support; 130 failed to do so. The Senate should have filed a bill; all 31 Senators failed to do so, and the Lt. Gov. also failed to prioritize the issue. For more of my thoughts, see this very detailed response and analysis that I wrote last Saturday. While other states are passing Constitutional Carry and other liberty expansions, Texas is stalling out on freedom and picking up steam with gun control. A couple of weeks ago, we asked you to call committee members, asking them to vote NO on HB 316. This bill would establish a purported “gun safety” public awareness campaign in an obvious attempt to control the way Texans think about guns. The advocates’ message was clear: guns have no legitimate purpose, and Texans should be encouraged to keep them locked up and inaccessible to themselves. Your phone calls definitely were noticed, and I received feedback on their effectiveness. Unfortunately, this bill was still passed out of committee last week with a 5-4 vote. Rep. Clardy crossed party lines to vote for this sneaky gun control measure. Now we’ll have to work even harder to stop this bad policy from passing. Here’s where I need your help again. Please call your own State Representative and State Senator — find their information here and call their Capitol offices. A staff member or intern will answer the phone; simply tell them that you are a constituent and ask them to oppose HB 316. It usually takes less than a minute and is generally more effective than an email. In spite of the grim news on Constitutional Carry last week, I’m pleased to report excellent success at last week’s hearings! This is in large part to your dedication. I owe a huge thanks to everyone who showed up last Wednesday. You made that day one of the best days I’ve spent at the Capitol so far this session. I can’t tell you how much it meant that nearly every hall I walked down, I ran into someone who told me they were there because they heard the GOA alert and wanted to support our bills. The suppressor bill was up first. If you haven’t already seen the video we produced for that bill, take a look here. Rep. Oliverson did a great job presenting his bill, which would remove Texas penalties for owning a suppressor without the NFA tax stamp and would keep our state from helping the feds enforce their anti-suppressor laws. Many folks presented excellent testimony, including Gary Groppe, COO of Silencer Shop and Warren Flick, GOA-Texas intern (and student at Texas A&M—-whoop!). The committee was impressed, and the bill is gaining support. Stay tuned. Kudos to those who stuck it out for 15 hours waiting to testify on the remaining gun bills. An hour or two before midnight, the Chairman finally got to the bills that most of us were there to speak on. I’m proud of the many activists who delivered strong testimony — particularly the college students who spoke against repeal of campus carry. Thank you all. The witness lists have not yet come out, but I’m confident we’ll see a very strong pro-gun showing. This week, the Texas legislature brings you more stupid public awareness campaigns and proposals for actual gun confiscation task forces, among other bills. I’ll be testifying on 9 gun-related bills this week. Remember you can always show up and register for bills, or sit in hearing rooms, or even testify. This helps more than you know! Here is detailed information about each of the hearings, including talking points for each bill. HB 1208 – makes counties have a method for keeping guns for prohibited people — not necessarily bad but opens the door for bad bills like below…. HB 3191 – NO – establishes a gun confiscation task force in each county to physically take guns away from prohibited people or those simply charged with domestic violence. Says that they can’t just give guns to a friend or family member for safekeeping. You can watch the livestream of House hearings here, and Senate hearings here. Again, for more information — including instructions on how to simply drop by the Capitol on any of these days and put your opinion on public record — please see the hearing information document. I think it’s obvious to all of us that Texas is not where it should be. We are falling behind in the gun rights arena. But that knowledge gives me all the more motivation to stand strong and fight for our liberties.